There’s often a negative stigma attached to “going to therapy.” People can believe that someone in therapy has something wrong with them, something that needs to be changed. But most people have never learned a healthy self-acceptance, or how to be vulnerable in relationships with other people. Many people have unresolved issues from their past, and could use guidance and support as they work through those issues. Still others need assistance forming deeper bonds with their partner or their friends. Going to therapy can help with all of those things. Regular meetings with a therapist can ensure that a person is staying attune to themselves and stays balanced, which can aid in consistent personal growth. You may be thinking about seeking therapy. If you are, you’re probably facing fears about that stigma, or about some other common myths surrounding the therapeutic process. The best way to overcome those fears is to reach out to a therapist. You will quickly discover that all therapists are different. It’s important to keep looking until you find one who truly understands you, one you share a connection with. You won’t be able to receive help from a therapist you don’t feel comfortable with. Here are eight insights into therapy that may help set your mind at ease if you’re seeking a therapist. Our society is full of proud people who are constantly comparing themselves with each other. But as we’re doing this comparing, we forget that all we’re doing is judging ourselves, and it’s all based on our own projections and fears. Everyone faces struggles in life. But if those struggles are exposed, we feel weak and insecure. People who seek therapy are strong people who are willing to share their struggles, weakness and insecurity. They are willing to admit they are in pain. They’re willing to submit themselves to a process that may be uncomfortable. And they’re motivated to work past that pain and discomfort because they know it will lead to growth. For a therapist to be successful, it’s important to be open and authentic in the counseling relationship. The therapy won’t achieve anything positive if all the therapist is doing is sharing his or her bias and opinions. A therapist should be seeking to offer collaboration as he or she offers helpful insight. A therapist should not be seeking to change a client, if that client is not seeking to change. A therapist’s overall goal should be to improve a client’s overall quality of life. He or she can only do that by being authentic in striving for goals that are mutually agreed upon. It may be shocking to discover how much a session of therapy is going to cost. But it’s important to consider it as a temporary investment that will significantly help you in the long term. Consider how much money is spent on superficial material goods that bring momentary joy, or on medicinal treatments that may cause a brief measure of relief. These are short-term pursuits that will bring only temporary relief. Think of your expenditure on therapy as a long-term investment that will improve your relationships and your life. Many therapists offer a variety of treatment plans at a range of prices. If you feel your therapist’s fees are too high, you can ask if he or she offers a sliding scale or financing. If not, he or she may be able to recommend another therapist that does. Couples therapy can be preventative. Though statistics differ, there has been a shift recently over to a style of preventive couples therapy. This represents a change from the old model, when couples waited until they were on the brink of separation before seeking outside assistance from a therapist or counselor. Now, it’s common for couples to begin counseling with the hope of gaining tools to aid in building their future relationship. It is never too late for a couple to begin working to repair and deepen their connection in their relationship as long as both people are participating, though the work will become harder the longer they wait. It’s common for younger couples to challenge the old model and seek to create authentic intimacy for long-term support and satisfaction within their relationship. Therapists help you help yourself. Collaborative interventions and suggestions will almost certainly be part of your therapeutic process. But reaching your goals in therapy is never about getting quick advice or steps to quick success. 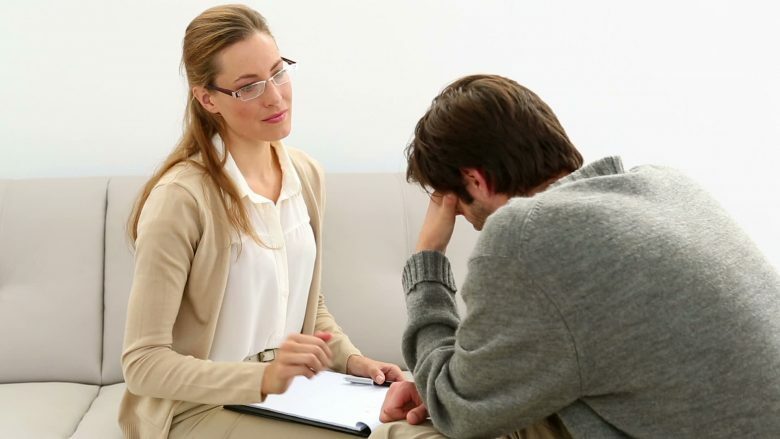 It is the job of a therapist to help the client help themselves. Whether individual or couples’ therapy, the process is not meant to be a quick fix. Each client’s process will be different. Therapists don’t seek to place blame. Every therapist is different. It’s important to have a genuine connection with your therapist. Definitely ask them how they approach their practice, how they prefer working with couples, and so on. But the job of a therapist is not to tell couples what to do and what not to do. A therapist is not going to place blame and make a list of rules that are impossible to follow. It is not the place of a therapist to shame couples. A therapist should not be issuing a one-size-fits-all to-do list as homework for couples to apply at home. They shouldn’t focus all of their practice exclusively on one aspect of relationships for all couples in therapy with them. A therapist is there to help couples discern why their relational connections have broken down. They should be trying to help couples come to new levels of empathy understanding so they can focus on moving forward, together, in a healthy way. Systems therapists don’t take sides. Many marriage and family therapists are trained to work in a systems approach, which means they work with all relationships in the system as a whole. So if the therapist is working with a couple, they will meet with both members of the couple and won’t “take sides.” They strive for objectivity, and their intent is to offer equal support to all members of the system. Their goal is to help everyone involved achieve more connected, secure relationships.